A Full Height Glass T-Shape Conservatory. The standard self build T-shape conservatory kit consists of a gable end model in the centre and a lean-to design on either side. When designing the T-shape try and keep the width of the gable to half the overall DIY conservatory size. This creates an aesthetically pleasing balance when viewed from inside or out. The gable end needs to project at least 300mm beyond the adjacent spurs to accommodate the structural valleys that join the three roofs together. The overall T-shape width should start at no less than 4500mm, using a six panel frontage, and 6000mm using eight panels. 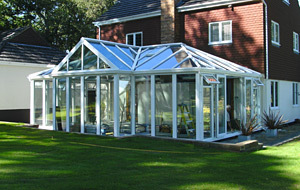 The standard DIY conservatory kit is usually supplied with hips in the two lean-to roofs. The alternative is to included triangular shaped, glazed panels which will sit on the conservatory frames. Keep in mind this is a more expensive option. It is always an interesting design option to use dwarf walls, or ¾ walls under the spur frames only and have the frame glazing of the gable end full height glass. This highlights the gable, which in itself is a design feature and expands the view which will give you more of the 'wow' factor. Keep in mind that the T-shape designs uses three roofs, so it will not be the cheapest option when trying to cover a certain area.